We offer these tip out trays and other kitchen accessories as yet another way that shelves that slide can make your life easier. From pull out shelves or sliding shelves to rev a shelf trash and recycle centers to blind corner systems to get organized and simplify your life. Choose from simple molded polymer trays with stop tabs that use your standard hinges or the large 36" tip outs with self-holdin hinges or the Euro style hinge. 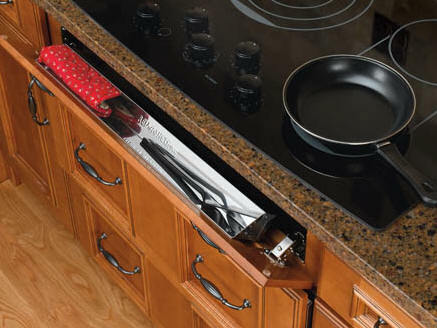 You will find a host of kitchen accessories and rev a shelf cabinet hardware in our on-line store. Either way just as with the pull out shelves from shelves that slide these tip-outs "make your life easier"